I have been working on the Dr Seuss Quilt. I got it layered and pin basted and marked. 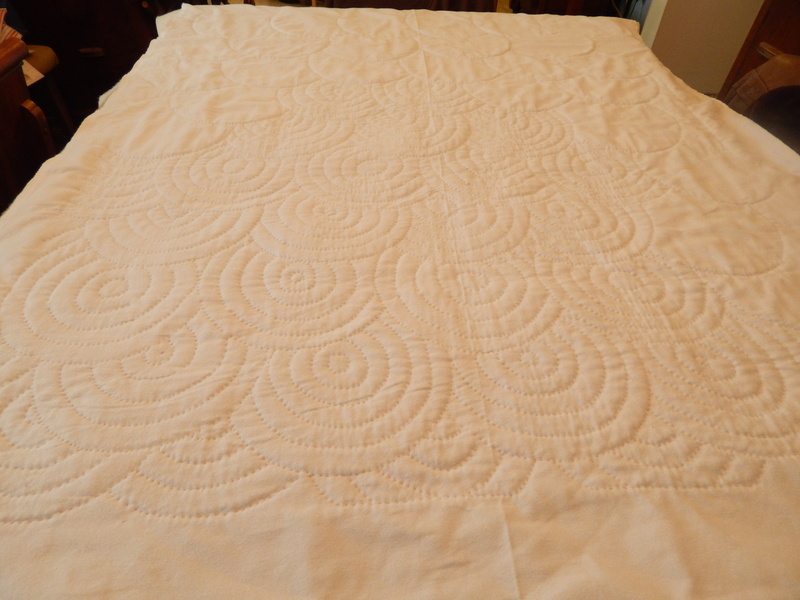 I used a small plate to mark the overlapping circles and then quilted them. 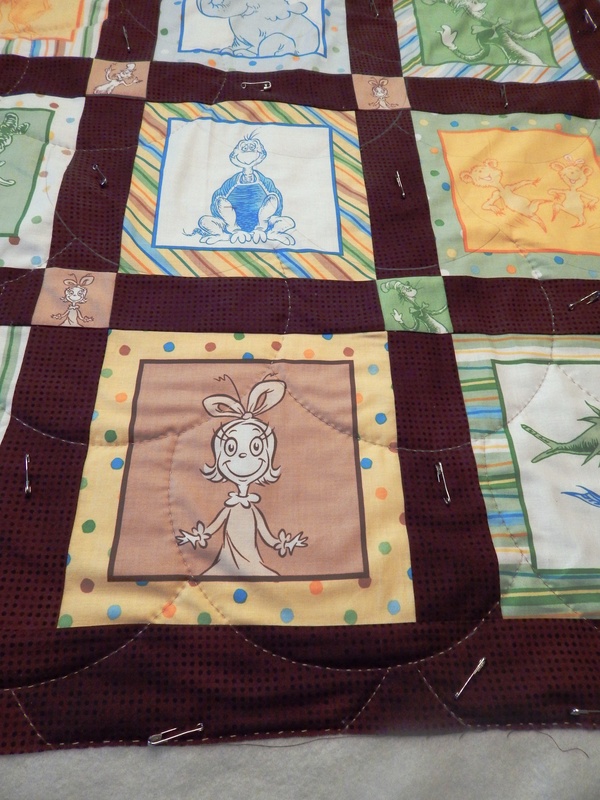 Now I am going back and adding the additional quilting. I am using a very thick tan thread and only about 6 stitches per inch (utility/big stitch quilting). There really was not a color of thread to use that would blend in because of all the different colors in the blocks so I decided on a somewhat neutral color. It is going very fast so I might be ready to bind it by tomorrow. The binding will be the same brown as the sashing. I will post pictures of that as soon as I finish. Meanwhile it is 3 degrees outside and will go down to negative 7 tonight with windchill temps of negative 35. We had well over a foot of snow yesterday (drifts 24 inches +) and everything in the city is closed. What else can a person do but quilt? 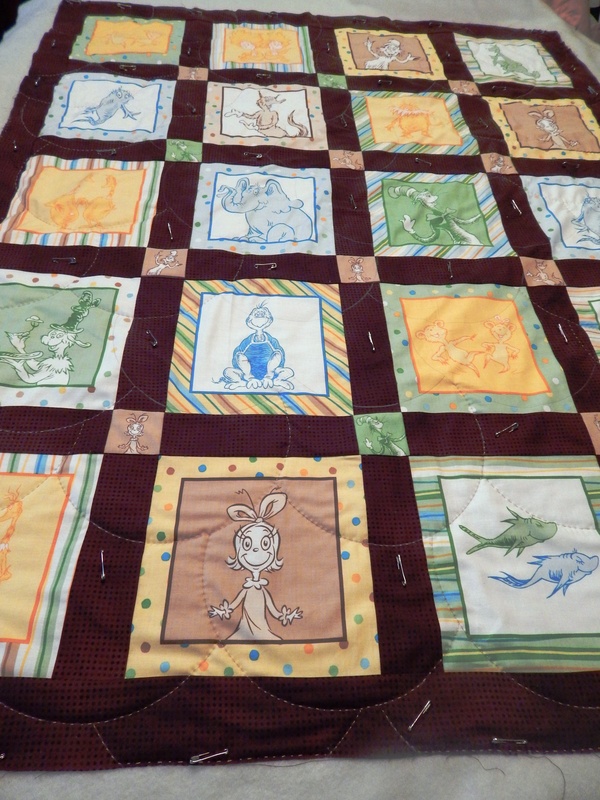 This entry was posted in Quilts and tagged baby quilt, Dr Seuss Quilt, hand quilting, Quilts. Your quilt is adorable! I love the Dr Seuss prints. Stay warm! Its horribly cold here in MN today too. I am glad its my day off work so I can stay home and sew. Happy Monday! Tell Teddy hi! love the quilting, wrap up warm! 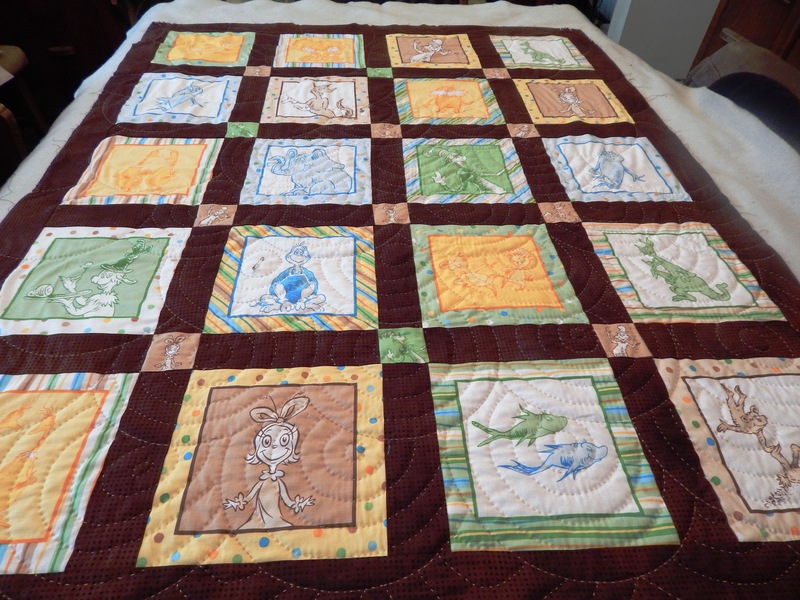 I have been checking out your blog for a few months now and am really dazzled, both by the completed quilts, and the volume of work you put out! 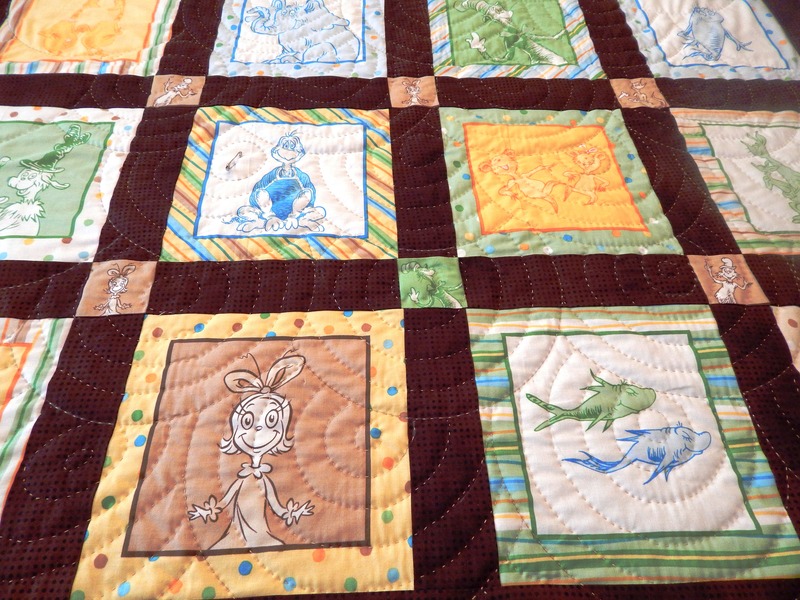 Very cool quilt — I love the dark sashing, and the circle quilting over those blocks is so “Dr. Seussy” — perfect. Tim, you are amazing. Your quilt looks great. I have this fabric and I love what you did with yours. 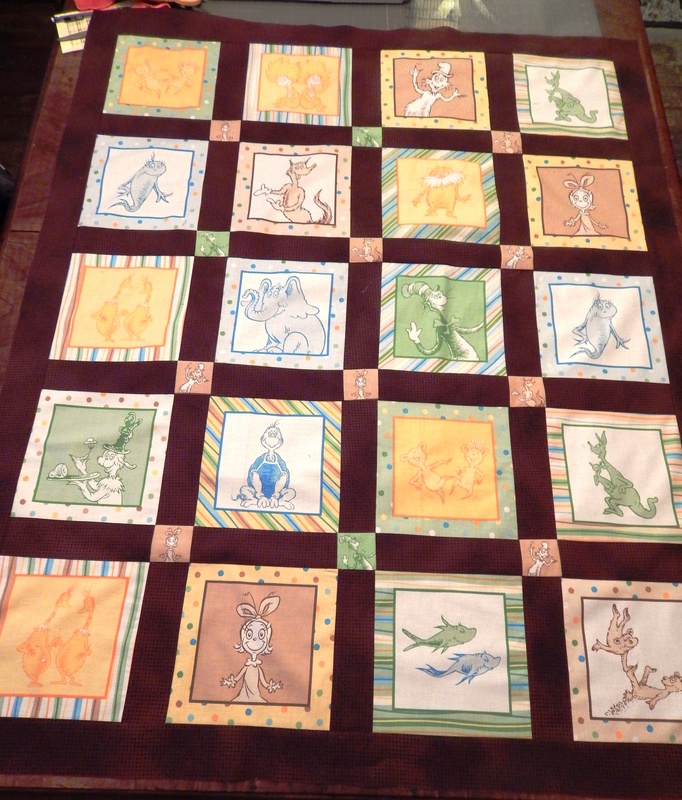 Thanks…..it is so much easier to be fast on a small quilt! Thanks Glenda! I was worried the I went to dark with the brown….but when I had it all together I liked it! Im jealous of your warm temperature!! so for you I will say stay cool!! … and from 29C tropical Australia at 7.50am! I love your big circle quilting, and think it’ll work well on a quilt I’m planning. Thanks for the inspiration! OK, well if it makes you feel better, I’m about to spend the day in an office without aircon, and we’re due to get 32C and very high humidity…! 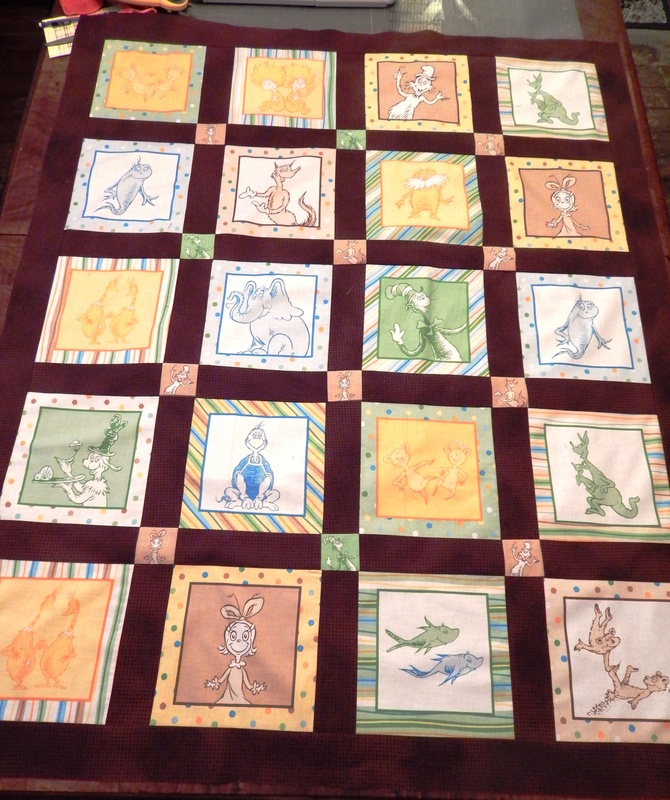 Love the quilting design! Perfect for this fun quilt! Good gosh, man — you are a quilting dervish! 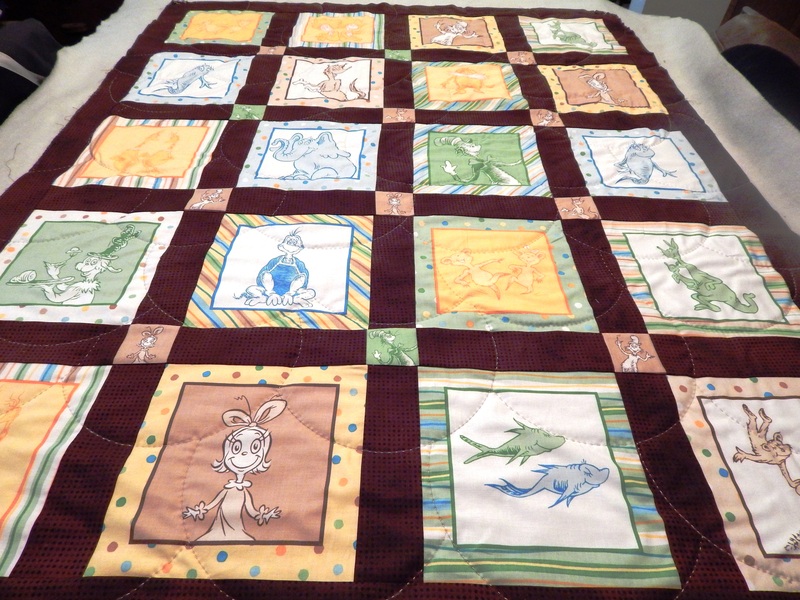 I like the dark side, am liking it very much for the context and the non-cutesieness for a little crib/boy quilt. HOLY MOLY!!! I can’t believe how quick you are…and yet it is a beauty. What boy/man wouldn’t want that sweet quilt as a reminder of his Uncle. I am sure it will be passed on to his little one some day. The babies in your family are very lucky to have such a generous and kind Uncle! Yup, up here we are shivering pretty good too. AHHHH..wood stove heat is lovely. But I am not going out unless I have too. I’ll bet Teddy isn’t crazy about this frigid weather. Stay warm you two! This is very cute! I can’t believe how quickly you have got so much done on it. my grand kids would adore this one. Good quilting weather-I can.t believe how very cold it is! My poor dogs don’t even want to go out.